Woohoo! First to comment (or so my browser says, at least)! Woman, you've got style to spare. And thanks for talking us through the process. Some of us have a LOT to learn. This looks so cool...I love it! This is so badass!! Love it! It's very Beetlejuice-y! Love it! I'm sorry, but my first thought was, "that's very piratey, Captain." Wow! I agree with Sheila, it has a beetlejuice-feeling - in a good way! It's a very statement piece and I can see you getting tons of remixing looks out of it. 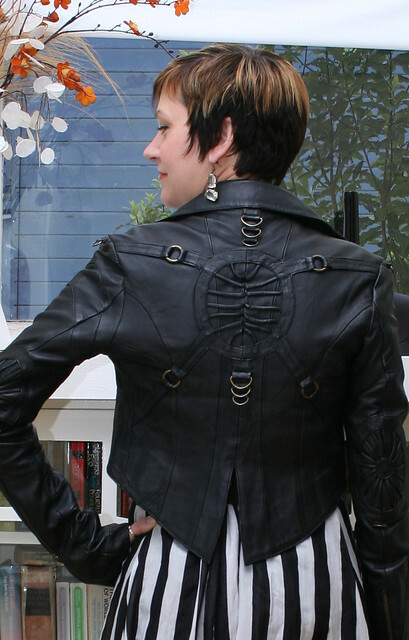 I just love that leather jacket too. The details of it are so incredible. Yes, Beetlejuice in a good way - cause that movie gave me nightmares. But this! is a fantastic look, very big-city. I agree with laniza, very badass! You are great at taking dramatic pieces and rocking them. I get nervous when I try and wear stuff like this, like people are going to immediately know I'm not cool enough to really pull it off, haha. But you look super classy. Plus, you work asymmetry really well, which I ordinarily kind of hate. 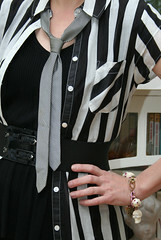 I differ from the other commentors in that the impression the shirtdress gives me is theatrical: creative and bold. Qualities I attribute to you as a person. I don't see it resembling any known cultural look (not even "Beetlejuice") which is a good thing because it looks original. A smash fashion-hit! Wow, I love this. It's very fresh looking!